Rock Werchter es sin duda uno de los mejores festivales dentro de Europa, que se celebra desde 1987 en la localidad de Werchter en Bélgica. P!NK, Bastille, Elbow, Paul Kalkbrenner, BROCKHAMPTON, Charlotte Gainsbourg, Richard Ashcroft, Ólafur Arnalds, Vance Joy, Raleigh Ritchie, Maribou State, Bang Bang Romeo y Kidcutup. Tool, The Cure, Bring Me The Horizon, Kylie Minogue, Years & Years, Weezer, Janelle Monáe, The 1975, Robyn, Jungle, Khruangbin, Nothing But Thieves, Tom Misch, Snarky Puppy, Kurt Vile & The Violators, The Twilight Sad, Masego, Jessie Reyez, Denzel Curry, Whispering Sons, Our Last Night, Foxing, Swmrs, Yonaka y Sea Girls. Mumford & Sons, Florence + The Machine, Macklemore, The Good The Bad & The Queen, Bear’s Den, Beirut, Angèle, Tourist LeMC, The Blaze, Two Door Cinema Club, Miles Kane, Clean Bandit, Aurora, Syml, Strand of Oaks, King Princess, Portland, Barns Courtney, All Them Witches, The Marcus King Band, The Slow Readers Club, Alice Phoebe Lou, Donny Benét, The Murder Capital y John J. Presley. Muse, Greta Van Fleet, Balthazar, New Order, Underworld, Parkway Drive, Mac DeMarco, Rosalía, Tamino, Ry X, $uicideboy$, Yungblud, Lewis Capaldi, De Staat, Dean Lewis, Mahalia, Lizzo, Grace Carter, Zeal & Ardor, Sports Team, Amyl and the Sniffers, Deaf Havana, Laurel, Black Honey y Didirri. 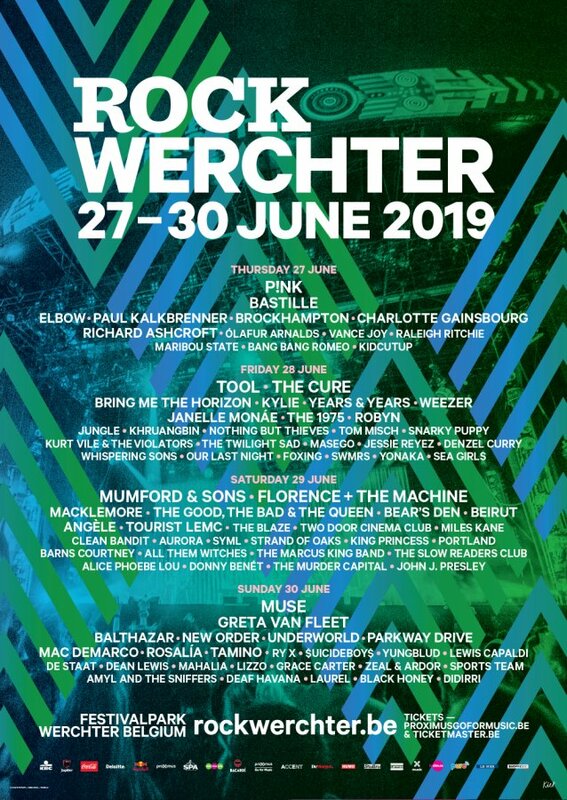 El Rock Werchter 2019 se celebrará del 27 al 30 de junio.